Glass Diameter: 80mm 3 1/4"
The NEAT Glass will bring your old favourite whiskies back to life again by revealing more aromas than your traditional whisky tumbler. 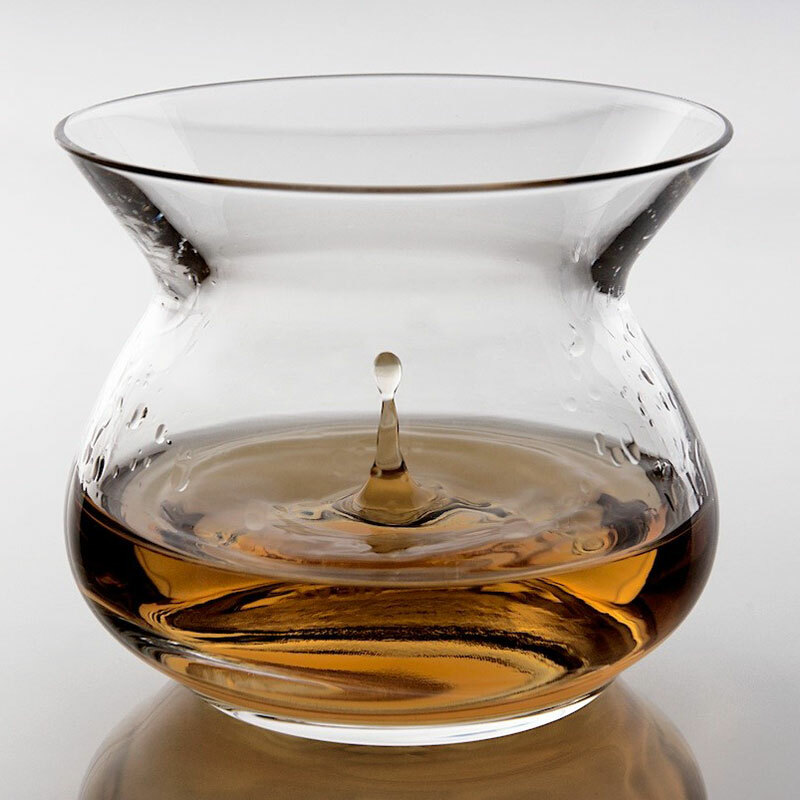 Designed and produced by glass-making artisans, this unique glass creates the ultimate whisky experience. 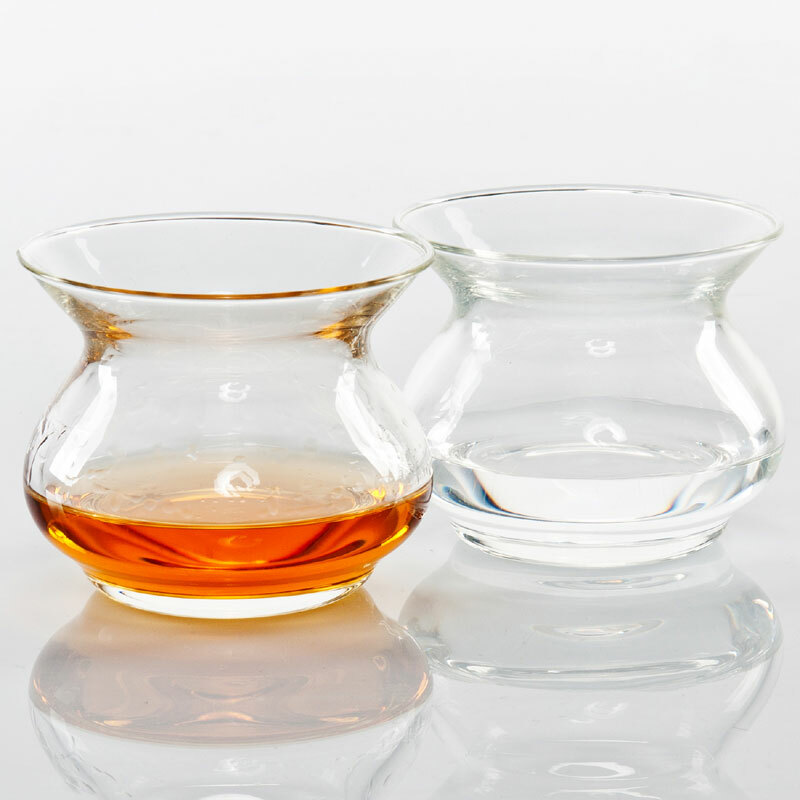 Through its beautiful, unusual and unique shape, the glass eliminates alcohol burn, one of the biggest factors blocking the whisky nosing and tasting experience and allows you to relish the full flavour, scent and pleasure of your whisky. 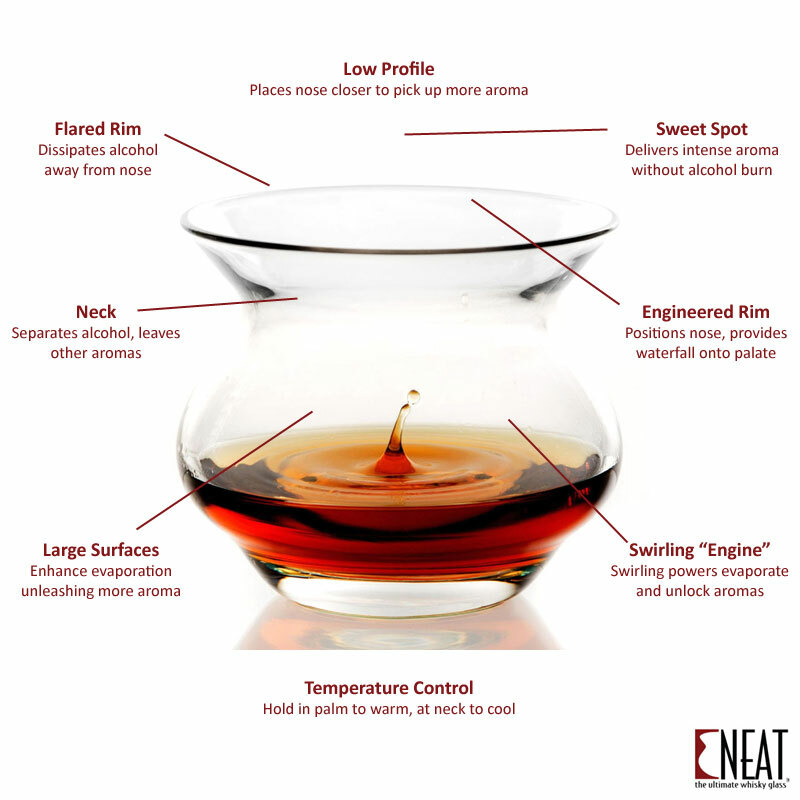 Fill the NEAT Whisky Glass to the widest point of the glass. Hold the glass level, at the neck to prevent overwarming, base to warm. Do not insert nose below the neck portion where alcohol is concentrated. Keep glass level, swirl and nose over the ‘sweet spot’ in the centre just above the rim. Taste. (The flared rim will flow your whisky across your entire palate). Have fun with it! Experiment with nose position and with different whiskies. 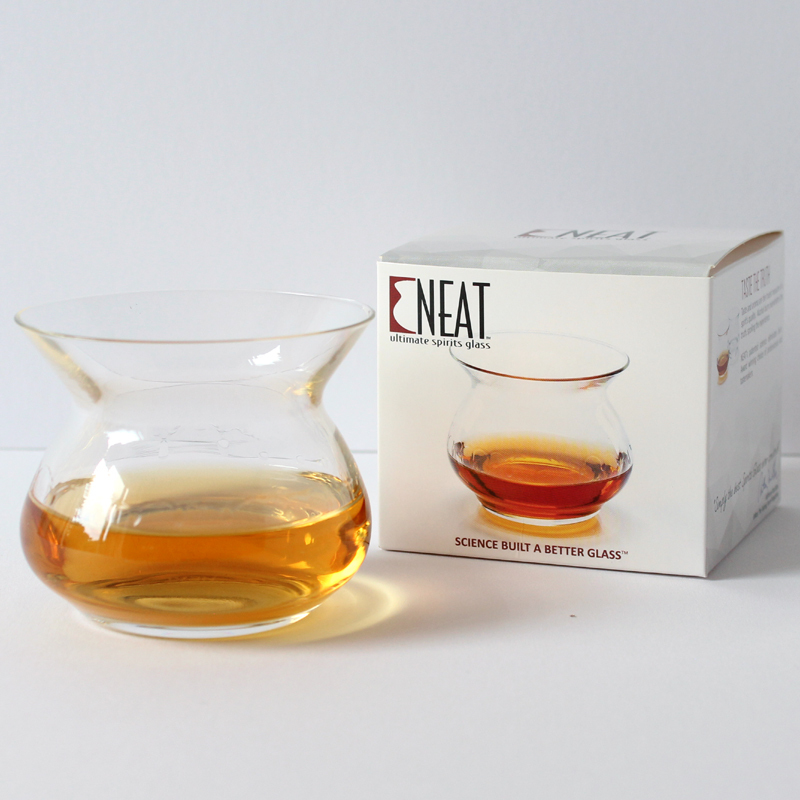 The single NEAT Ultimate Whisky Glass is supplied in a printed gift carton. A worthy alternative to the Glencairn glass? As a Glencairn glass owner, I was interested to see if the NEAT glass would equal or better a tulip-style glass for appreciating whisky. Some observations: - The NEAT glass is quite chunky, it fits in the hand quite well and may appeal to those who like a tumbler style than the slightly more delicate tulip glasses - It gives a good presentation of the 'nose' of the whisky, although the 'sweet spot' indicated on the carton doesn't seem to give a better or worse impression than the rim of the glass. For nosing a whisky, I still think I prefer the Glencairn glasses as they provide a more concentrated aroma - Despite worrying about spillage for tasting with the wide glass brim, this actually works quite well. Does seem to add something different to the taste, due to a wider spread across the palate or different surface area perhaps. 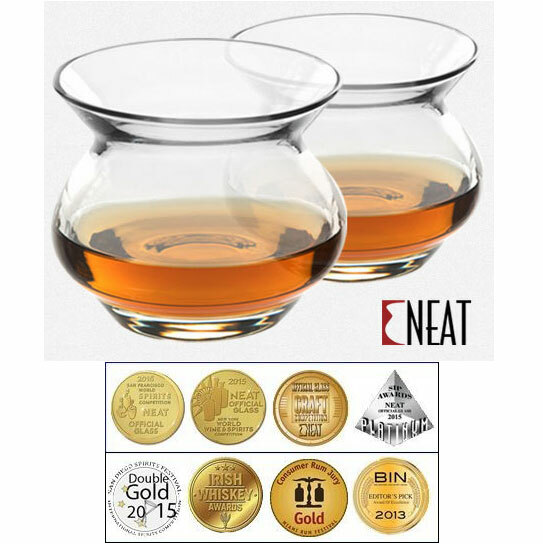 Trying two identical whiskies in the NEAT and Glencairn glasses (all in the name of science, you understand) seemed to give different tasting experiences All in all, it's a nice glass and won't disappoint a whisky fan if you buy one and try it out. I ordered 8 glasses.The boxes for two arrived damaged and upon contacting Wineware, they sent out two replacement boxes. The packaging for the two new boxes was far more excessive than the box the glasses arrived in! I'm in love with those glasses, the best for drinking high proof whiskeys. Was tired of the Glencairn glass, i'm glad i found those "Neat" glasses. They are/feel solid, some quality glasses, and they look nice too. I bought this for my 83 year old step-dad, who loves his whisky and I needed to get him something different for his birthday. He was thrilled with the glass and has used it already, enjoying the novelty of trying a new way of tasting whisky.